The Board showed no ♥ for this applicant, affirming a refusal to register the mark I LOVE YOU for bracelets. The Board found the phrase to be merely ornamental and therefore failing to function as a trademark. [It refused to consider the argument, raised for the first time in the examining attorney's brief, that the mark is a widely used informational message that is incapable of functioning as a mark.] To add insult to injury, the Board also affirmed a Section 2(d) refusal on the ground of likelihood of confusion with the registered mark I LUV U for "jewelry, namely, necklaces, bracelets, rings and charms; pendants; earrings." In re Peace Love World Live, LLC, 127 USPQ2d 1400 (TTAB 2018) [precedential] (Opinion by Judge Marc A. Bergsman). In assessing a failure-to-function refusal, and particularly whether the mark is merely ornamental, the Board may consider whether the mark at issue is a common expression. TMEP Section 1202.03(a). The examining attorney did not request remand in order to make an alternative refusal that the mark fails to function because it is a common expression incapable of indicating source. And so the failure-to-function issue was ornamentality. Failure to Function: The crucial question, of course, was whether the applied-for mark would be perceived as a source indicator. See In re Keep a Breast. Found., 123 USPQ2d 1869, 1879 (TTAB 2017); In re Hulting, 107 USPQ2d 1175, 1177-1179 (TTAB 2013); In re Lululemon Athletica Can. Inc., 105 USPQ2d 1684, 1686 (TTAB 2013). Examining Attorney James F. Turner contended that the mark "conveys the common expression of endearment," supporting this assertion with numerous examples of I LOVE YOU, and variations thereof, used on bracelets and other jewelry. See D.C. One Wholesaler, Inc. v. Chien, 120 USPQ2d 1719, 1716 (TTAB 2016) (widespread ornamental use of I ♥ DC may influence how the mark is perceived). The size, location, dominance and significance of the mark are relevant to the determination. In re Hulting 107 USPQ2d at 1178 (NO MORE RINOS fails to function as a trademark for bumper stickers, clothing, and campaign buttons). Here, the phrase I LOVE YOU is "essentially the bracelet itself." It "conveys a term of endearment comprising the bracelet and, thus, it is ornamental. It does not identify and distinguish the source of the bracelet, especially where there is so much jewelry decorated with the term I LOVE YOU in the marketplace." 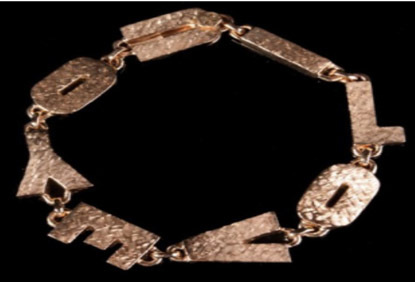 The ornamental nature of the applied-for mark is corroborated by third-party use on bracelets and other jewelry, such that consumers are accustomed to seeing the phrase on items from other sources. Lucian Piccard "I LOVE YOU BRACELET"
Applicant contended that I LOVE YOU is the "theme of the product," but that contention merely supported the Board's finding that the words are an aesthetic feature of the goods, and that consumers will perceive the phrase as an important component of the product, rather than as a trademark. See D.C. One Wholesaler, Inc. v. Chien, 120 USPQ2d at 1716 (“the display [of the mark] itself is an important component of the product and customers purchase the product precisely because it is ornamented with a display of the term”). Applicant also maintained that customers recognized the "common distinctive thread" of its products - "love and peace oriented themes having playful and chunky design elements." The Board pointed out, however, that applicant is seeking to register a word mark in standard characters. In any case, the "look of the letters as they appear on the goods in the specimen is a reason I LOVE YOU would be perceived as mere ornamentation ...." Moreover, applicant did not seek to register the subject mark under Section 2(f), and so the Board cannot consider applicant's argument regarding the renown of its business or customer recognition of a common style of its products. In any case, the Board noted, the evidence appeared to preclude any claim of acquired distinctiveness under Section 2(f) because applicant's use has not been substantially exclusive. And so the Board affirmed the failure-to-function refusal. Likelihood of Confusion: Both the subject application and the cited registration include "bracelets," and the Board must assume that these items travel in the same channels of trade to the same classes of customers, namely, ordinary consumers. In re Viterra Inc., 101 USPQ2d 1905, 1908 (Fed. Cir. 2010). Moreover, when the involved goods are identical, a lesser degree of similarity between the marks is necessary to support a finding of likely confusion. Arguing that the cited mark is entitled to only a narrow scope of protection, applicant submitted seven third-party registrations for variations of I LOVE YOU for jewelry: I WILL LOVE YOU FOREVER, I LOVE YOU ALWAYS and Design, P.S. I LOVE YOU, THE NEW WAY TO SAY I LOVE YOU, I LOVE YOU EACH DAY OF THE WEEK, MORE THAN 100 WAYS OF SAYING LOVE, AND LUV HER. The Board, however, pointed out again that I LOVE YOU is a commonly used term of endearment displayed on jewelry. Consequently, "consumers are conditioned to look for differences among trademarks consisting of or including I LOVE YOU for jewelry." Applicant contended that I LOVE YOU has a traditional feel, whereas I LUV YOU "is used as an abbreviation in telecommunications" such as texting and social media entries. The Board was not moved: "Even assuming I LOVE YOU has a traditional feel, the marks still look alike, sound alike, mean the same thing and engender the same commercial impression (i.e., a term of endearment)." The slight differences in spelling do not distinguish the marks. The Board concluded that the "strong similarity" between the marks weighs in favor of a likelihood of confusion. Balancing the relevant du Pont factors, the Board found confusion likely, and it affirmed the Section 2(d) refusal.